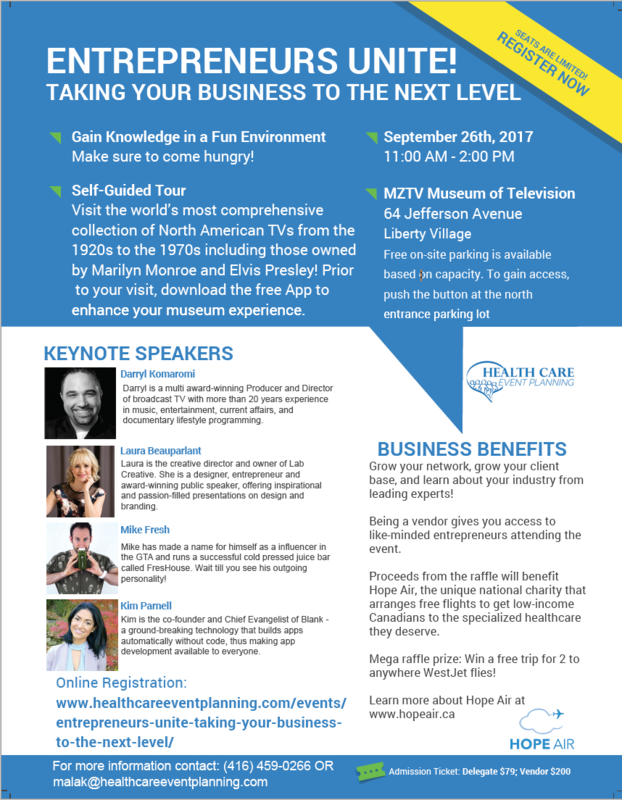 This unique event will showcase experts in their field who will share their lessons honed over the years. Speakers include Darryl Komaromi, multi award-winning Producer and Director of broadcast television with more than 20 years experience in music, entertainment, current affairs, and documentary lifestyle programming; Laura Beauparlant, Entrepreneur, Creative Director & Branding Expert of Lab Creative Inc; Mike Fresh, Owner of Freshouse Food & Juice Bar, Kim Parnell, Founder of Blank, a company assisting start-ups with App development and Giuseppe, our MC extraordinaire who is a an intrepid social media whiz. In addition, you will get the opportunity to tour the MZTV Museum of Television which features the largest collection of TVs from the 1920s to 1970s including those owned by Marilyn Monroe and Elvis Presley! We recommend that you download in advance the free App Mztv.com/app to enhance your museum experience. This event features a delicious lunch so come hungry! Free on-site parking is available based on capacity. Push the button at the North lot entrance to gain access. A portion of the proceeds from this event will be donated to Hope Air, a unique national charity that assists patients to access medical appointments in specialized hospitals far from their home. Raffle tickets prizes include 2 airline tickets to anywhere around the world where WestJet flies, a two day detox session, 1:1 mentoring by Kim Parnell and more! Cancellation Policy: Cancellations received 3 business days prior to the event will be refunded at 50% minus a $25 processing fee. No-shows and cancellations received less than 3 business days are non-refundable. Substitutions are allowed.